Anyone who has any type of difficulty walking or gets tired after walking a short distance could benefit from using a mobility scooter. Using a mobility scooter is not an admission of defeat and can make a great deal of difference to your quality of life. It can provide a new lease of life and a new found independence. If you are thinking about getting a mobility scooter then it is probably past time to do it. However, the sooner you start using a mobility scooter the longer you might retain the ability to walk. A mobility scooter can give you more energy because you won’t be using all your energy in trying to walk or push a traditional wheelchair. Using a scooter will help to relieve the strain on shoulder muscles and wrist and elbow joints that are used when pushing yourself in a self-propelled wheelchair or someone else in a traditional transit wheelchair. A mobility scooter can help to provide you with the freedom to go where and whenever you want. Some models are capable of travelling up to 35 miles between charges the distance you can cover is much greater than in a traditional wheelchair. If you are unsure if you would benefit or enjoy using a mobility scooter there are many options to try them out in different situations. 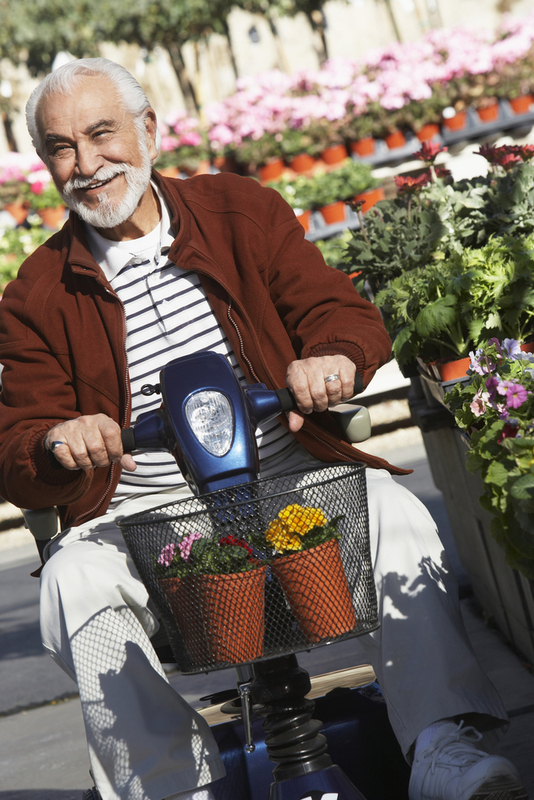 Many supermarkets and DIY stores offer customers the use of a mobility scooter whilst shopping why not try one and see if it makes shopping any easier. Some large shopping centres or town centres offer Shopmobility which is a scheme that lends or hires mobility equipment based on the user’s requirements they provide brief training on using the equipment. If you go on holiday why not arrange to hire a mobility scooter and see if it makes a difference. By getting an electric mobility scooter you can open many doors that have been previously closed, perhaps because of a disability or illness: such as going shopping, going out for the day, going for a “walk” with your partner, friends or the children or grandchildren. You can go up and down steep hills in comfort and without fear of rolling down the hill, and without being worn out for days afterwards. You can visit friends and relatives at your convenience without needing to rely on public transport. Most mobility scooters have a key to start them, and so if the key is removed the scooter cannot be driven. This means that the scooter can be left outside a shop for example and it can be locked like a car. If you think that you, a friend or relative could benefit from a mobility scooter why not try some and find one that you like. If you know somebody with a mobility scooter why not ask them about it and what improvements it has brought them. Mobility scooters can mean the difference between managing to live at home independently and having to rely on others.